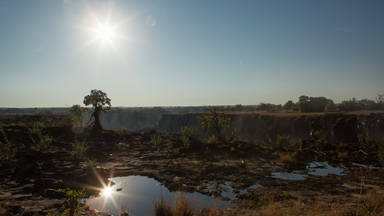 Tongabezi is a luxury lodge near Victoria Falls on the banks of the Zambezi River. It was founded in 1990 by Ben Parker and the late Will Ruck-Keene, pioneers of eco-tourism in Zambia. Privately owned and run, Tongabezi combines romance and exclusivity with warm and attentive service. Each house and cottage has its own valet who takes care of guests throughout their stay and act as a private concierge. There is no set pattern to days at Tongabezi. Guests can do as much or as little as they wish, with game drives, bush walks and boating trips all included in the price. The majestic Victoria Falls can be viewed on foot in the National Park, from inside the gorge, from Livingstone Island, and from the air. The Lookout was conceived as the ultimate chill-out zone next to the existing Tonga Lounge, dining and cocktail decks. With its feet planted firmly in the Zambezi, the Lookout offers guests the chance to feel at one with the great river, and the separate levels ensure extra privacy. Whether you need to check in with the world in our high-tech ante room, celebrate life and all its glories with a meal or take a deep breath to practice the forgotten art of hibernation, the Lookout provides the perfect space. The Tongabezi vision is legendary. Extravagance here is not a function of how much we can impress our guests with largess, everything we do is carefully calibrated to provide the physical and spiritual realm for all our visitors to achieve the holy grail of travel, returning to reality with renewed verve, a clearer, more sparkly version of yourself. 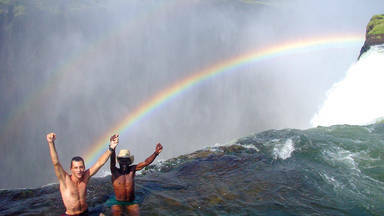 Activities included in the price of your safari holiday include canoeing on the Zambezi, island lunch, sanpan floating candlelit dinner, visit to Mukuni Park, sunrise and sunset boating, introduction to Simonga Village, guided bush walks, museum tour, fishing, game drives and a Maramba Market visit.